DR. PHIBES RISES AGAIN: Pop-Gothic Leftovers Can Still Be Tasty – Schlockmania! American International Pictures wasted no time when The Abominable Dr. Phibes became a hit vehicle for star Vincent Price: the next year, they had a sequel at the theaters with Dr. Phibes Rises Again. Despite reuniting director Robert Fuest with Price, this sequel is often looked upon as a lesser, somewhat muddled piece of work. That said, there is plenty of pop-gothic fun left in the character and premise if you can make allowances for some visible seams in its storytelling. 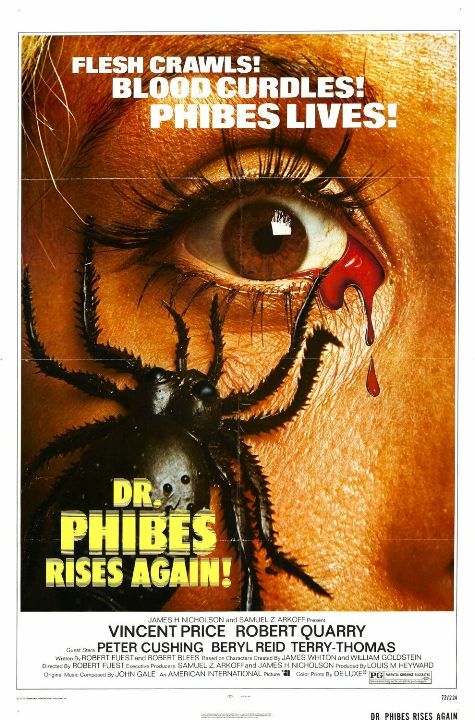 Dr. Phibes Rises Again starts three years after the end of the first film’s events. It is quickly revealed that Dr. Phibes (Price) was merely hibernating and has arisen once more, complete with trusted assistant Vulnavia (Valli Kemp), and this devilish duo heads for Egypt so they can access “the river of life” that will revive Phibe’s beloved wife. Unfortunately, there is competition for this discovery in the form of Biederbeck (Robert Quarry), a scientist who is ruthlessly driven in his quest by a supernatural secret of his own. As the two race to a finish line located beneath an Egyptian pyramid, Phibes and Vulnavia bump off Biederbeck’s acolytes in colorfully g ruesome ways. However, they soon find themselves not only having to contend with Biederbeck but also Scotland Yard inspectors Trout (Peter Jeffery) and Waverly (John Cater). Legend has it that Dr. Phibes Rises Again was a troubled production: there was tension between Price and Quarry and budget slashing resulted in some hasty rewrites and added dialogue for Dr. Phibes. 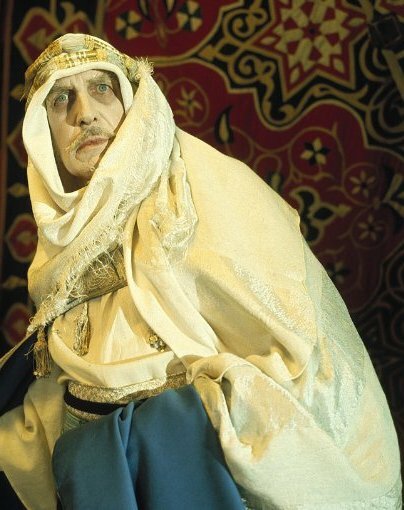 The story problems show in the film as the storyline often feels disjointed until it reaches Egypt and the reasons for Phibes’ murders are both less clear-cut and less interesting this time around. It feels like Phibes “talks” via his voicebox about three times as much as he did in the last film and much of it is awkwardly crafted exposition thrown in to keep the story afloat. However, it’s easy to overlook these problems if you approach Dr. Phibes Rises Again in its intended spirit. The Phibes films are essentially macabre black comedies shot through with a wonderful sense of baroque visual style. Thanks to the efforts of Fuest and his crew, the style holds together beautifully and keeps the wonkier parts of the story moving forward. Brian Eat well’s gorgeous, art deco-influenced sets mix in Egyptian touches this time around and Fuest makes them look sumptuous with the help of cinematographer Alex Thomson. Fuest uses their artistry to create a playful yet extemely stylish vehicle for ghoulish wit and some E.C. Comics-style setpieces (look out for the one involving scorpions). Even when the story hits dead ends, Fuest’s style is fun for horror fans to luxuriate in. Best of all, Fuest tops it off by getting ace performances from a smartly selected cast. Price hams it up in a charming way, despite the characterization requiring him to never speak, and Quarry makes an excellent foe who provides a nice contrast with his icy, straight-faced nastiness. Jeffery and Cater provide sublimely low-key comic relief as the inspectors who follow Phibes’ outlandish murders with quiet frustration and there are brief but fun cameos from Peter Cushing, Terry Thomas and Beryl Reid. In short, Dr Phibes Rises Again is more like a stylishly crafted set of leftovers than a sequel that can stand on its own two feet. 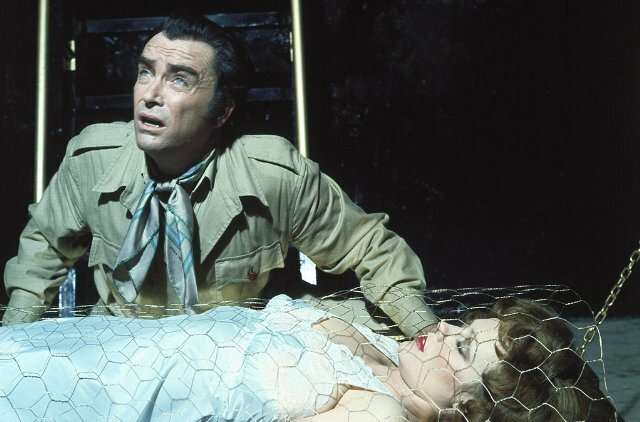 That said, Price and Quarry give the proceedings a shot of life and no one ever quite made baroque horror films the way Fuest did. As a result, this ‘shocks & chuckles’ ride still offers plenty of ghoulish fun.